Hinely is quite busy with 35-40 horses in training throughout the year. Deann Hudson has been a vital part of keeping the business running smoothly while Hinely is away at horse shows or family events. Hudson has been Hinely’s assistant for almost 20 years. She works great alongside Hinely. Hinely specializes in the trail and western riding, while Hudson particularly enjoys the hunt seat. Having two people cover different disciplines helps the business in all aspects. Trendsetter Performance Horses also offers numerous exceptional horses for sale during all times of the year Hinely enjoys this side of her business as well as training for her own clients. Kimes Ranch has had multiple Facebook contests over the years. Hinely was actively part of one of them that eventually led to her becoming part of the team. Many young people coming out of their youth career want to enter the industry as a trainer. Hinely offered some great advice for their future paths. Hinely has had a very successful career in AQHA with numerous World and Congress champion riders. She also holds multiple titles herself. We wish her team the best of luck this year! 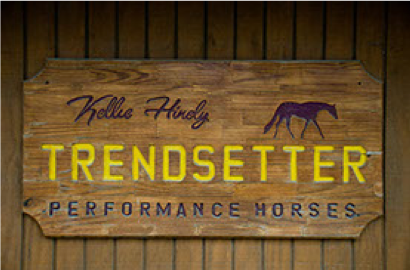 Keep up with Trendsetter Performance Horses on the sites below!